Freelance writing success isn't just about how much money you make. It's also about your resulting lifestyle. If you only "succeed" financially because you're working 12-16 hour days, you're doing something wrong. One of the biggest perks of freelance writing is that our job tailors to our lives -- not the other way around. We can work from anywhere. We can take time off when we want to. We can work in pajamas and fuzzy slippers (my current work attire). That's where freelancing can become a challenge. And I'll admit it. I'm not a naturally disciplined person. I love the freedom of freelancing. If I want time off, I take it on a whim without a second thought. Even though I work best when I keep myself on a rigid schedule, there's nothing I like more than breaking my own rules. I have no interest in being one of those 16-hour-per-day writers (I was one for years). I have no interest in rushing to meet deadlines someone else set (why I also set my own deadlines for client projects -- more on that in a bit). I have no interest in working so hard that I exhaust myself and start hating the job (oh, don't get me wrong -- I exhaust myself; but my work is usually a relief, not the cause). If, like me, you have no interest in those things, you learn to work smarter rather than harder. I'm sure you've heard that before. But what does it actually mean? Simple: "Work smarter, not harder" means you find ways to get more done and make more money in less time and / or with less effort. And there's one particular productivity tool that helps me more than anything else. Look. I've always been a bit of a productivity junkie. And I'm a huge fan of to do lists. I've shared my to do list strategies with you here over the years, and I still use all of them for different things at different times (especially white boards and index cards). 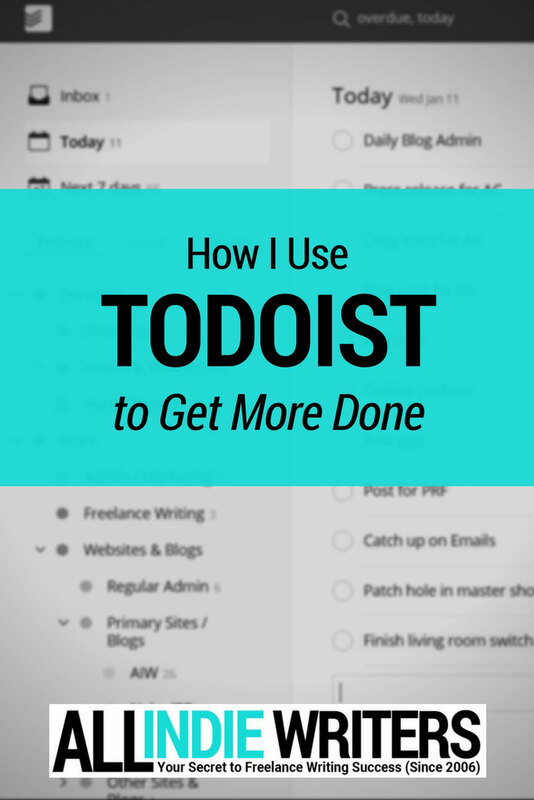 But even when I use other to do list and organizational tools, I always go back to the mother of them all -- Todoist. The way I usually put it is that "Todoist is like having a virtual backup of my brain." Today I'd like to tell you a bit about how I use Todoist and how it might be able to help you organize your writing, your business, and your life too. Todoist as my "Everything Organizer"
One of my favorite things about Todoist is that I can use it to organize and plan pretty much everything. I also keep track of my daily workouts, shopping lists, home improvement projects, and routine chores. If there's something I need to do on any given day, it'll show up on my daily Todoist list. One of my favorite aspects of Todoist is its portability. I can take it anywhere and everywhere. It's in my usual browser. It's on my phone. It's on my tablet. And it syncs beautifully, so when I mark a task as complete on one device, it's cleared from my to do list on all devices. Todoist's scheduling capabilities are fantastic. You can use plain language to set up scheduling and even repeat tasks. That might be as simple as typing "Every Tuesday" to schedule a task to repeat every Tuesday. Or you might want something a bit more unusual (tough for a lot of to do list apps to handle) like "every 6 months starting January 12" -- just type it like that and Todoist knows what to do! If you've ever been frustrated with scheduling limitations in other to do list apps, check out this short video from Todoist on what you can do with theirs. Really, this blows most other apps I've used out of the water (and I've used plenty). Not every task or list needs to be scheduled. That happens when I use Todoist for planning instead. That could mean anything from using a grocery list (which you can share with other members of your household) to creating a website development to do list where I'm not worried about specific deadlines for each task. Todoist lets me organize it all. And that makes it an indispensable tool both in business and in life. 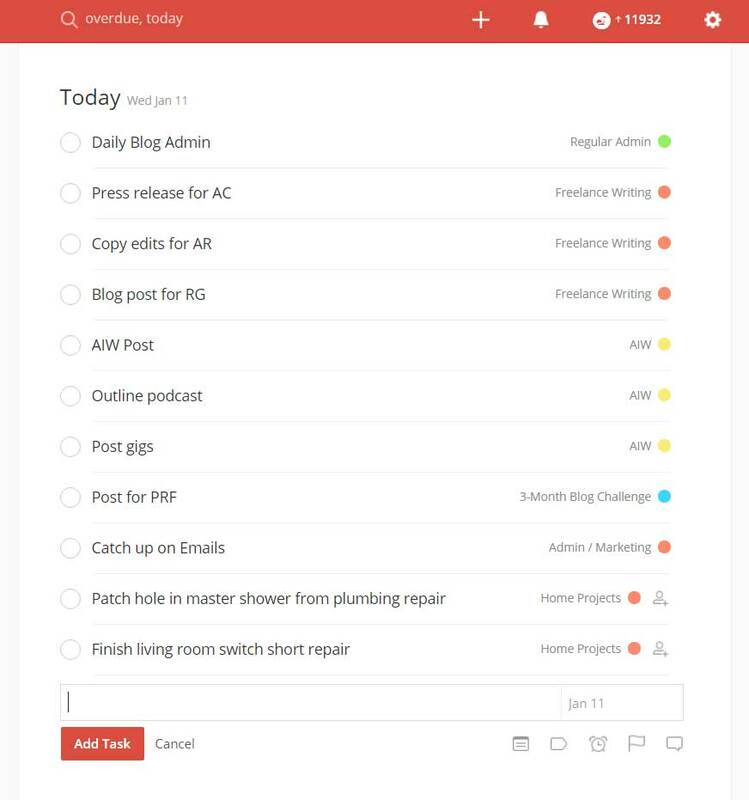 Todoist uses a "project" hierarchy to let you organize things. I start with my top-level projects -- Personal and Work. My Personal project folder is then broken down into things like Health & Wellness (that's where I organize my workouts), Shopping (where I keep track of grocery lists and other things needed around the house), and Home Projects (such as repairs or chores I don't want to forget about). My Work folder is the most important though. It's the master project for everything in my business. 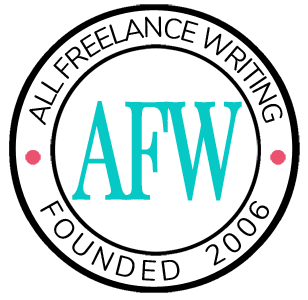 I mentioned recently that I run a 3-prong business -- freelance writing, blogging, and indie publishing. So my Work folder (or primary project) has sub-projects for each of those areas, as well as one for general admin and marketing tasks. But I break it down even further. For example, in my indie publishing project, I set up sub-projects for each pen name. Then, under each of them, I have sub-projects for each series and / or book, depending on what I'm working on. My Websites & Blogs project is broken down as well -- with a site admin project, then sub-projects for every website or blog I own. I even have a separate project section for sites in development, to keep them separate from active sites. The freelance writing side of my business is much simpler. So I don't break that down into further sub-projects. I just schedule all client projects, calls, and related tasks under the main Freelance Writing project. Earlier I mentioned that I can't stand operating on someone else's schedule. That includes client deadlines. So I have another simple rule: I try to under-promise and over-deliver whenever possible. And Todoist helps with that too. I do that by setting my own project deadlines. Those deadlines are usually days to weeks earlier than a client's actual deadline. Basically, I use Todoist and those early self-imposed deadlines to build a bit of padding into my schedule. I can track the delivery dates clients give. But I can also work with my own timeline for any given freelance writing project. So far, everything I've shown you is available in Todoist's free version. So there's no reason not to sign up and play with it for a bit to see if it works for you. But I'm a Todoist Premium user. So I have a few other cool options to work with. I won't go into detail about those because they won't be accessible to all of you, but at less than $30 per year, this easily pays for itself in the time it saves me. So I do want to give you a quick overview. You can attach comments and files to tasks (handy if you use it for collaboration). You can use location alerts (set iOS or Android alerts when arriving or leaving certain places -- like an alert to pick up printer paper the next time your phone shows you're near your local office supply store). You can use an unlimited number of email or text reminders for important tasks. You can export tasks to calendar tools (I have mine tied to Google Calendar for example). You can set up a label system for tasks in addition to your priority levels and project groups. You get even more features than that actually. But the last feature in that list is my favorite and why I'd stick with premium even if I didn't need the larger project limit (the limit is 80 projects for the free account and 200 for premium, though you can archive inactive projects so they don't count towards that limit). I've mentioned "5-minute lists" here before. This is when you have a list of tasks that can each be completed in five minutes or less. These quick-task lists are one of my favorite productivity tools (right along with Todoist and things like the Pomodoro technique) because they keep me moving forward no matter how much, or how little, time I have at any given moment. And this is the main thing I use labels for. No matter what project a task is in, if it can be done in five minutes or less, I slap a "5-minute task" label on it. Then, when I'm just not feeling "it" and I'd rather do anything but work, I can pull up a task list using that filter. I figure, "fine, I'll go goof off if I really want to, but let me just knock out one quick thing so I don't feel like a total louse all day." And once I've done that and I have the satisfaction of knocking something off my to do list, 9 times out of 10 I opt to do another quick task. Then sometimes another. And another. Before I know it, I've spent an hour working and have several things finished that I never thought I'd complete that day. So yeah, that little label feature is a big deal for me. And that's the gist of how I use Todoist! I organize everything by projects and sub-projects. (You can use sub-tasks too to narrow things down even more.) I schedule what needs to be scheduled. I use Todoist for collaboration occasionally (like the joint project list with Lori Widmer for our upcoming launch of Freelance Writing Pros). As I put it in one of the other posts linked above, Todoist is like having a personal assistant with you at all times. Who wouldn't want that? If you're looking to get more organized this year in your writing business, or if you want to more fully embrace the "work smarter, not harder" principle, Todoist might be just what you need. You'll get most of these features with a free account, so why not sign up today and give it a try? I’ve been using Todoist for nearly a year now, and it is absolutely indispensable! I don’t label my projects like yourself, but I suppose that’s just a matter of getting familiar with the app’s text shortcuts. I’ve been debating purchasing the premium plan, if only just to support the company. The calendar linking is really tempting, however. Like you, I’ve tried many other productivity apps, and in fact, I just ran across another one called 1-3-5, but I resisted, because Todoist takes the cake. Have you tried working Instagantt with the app? I attempted it for a little while, but being that I spend more time on my devices than the laptop/browser, it became kind of useless. But given your big schedule and pristine organization skills, I think it could be useful for you! I’ve not used Instagantt. For Gantt charts I like TomsPlanner.com. I don’t use them on a daily basis though, so haven’t tried integrating with Todoist in any way (I’m fond of the Tom’s Planner interface though so probably wouldn’t). I use them more for long-term publishing planning and campaign planning. So glad this came up in my Google search for some tips on Todoist. You presentation made it much easier to get my Premium version set up. $29 a year is a no brainer and it supports a great product. That it does. Poke around for promo codes too. Someone sent me one a little while back and I basically got a year and a half’s worth of time added onto my current premium subscription. Some are one-time use (if your friends get one for hitting milestones, they can share those). But there were a couple of public ones a month or so ago too, and I think they’d add another 3 months at least.